Carol picked up this book (pictured) at a thrift store recently. The title caught my attention. 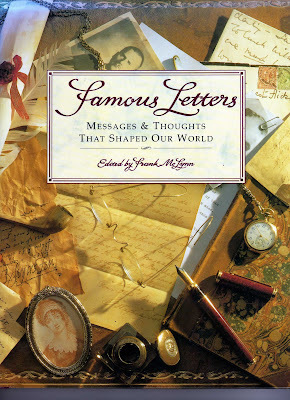 FAMOUS LETTERS, Messages and Thoughts That Shaped Our World. Being involved in a letter-writing ministry I thought of the thousands of letters I have written and wondered if any of them would be considered "famous". Hopefully some of them have "shaped" the world of the athletes to whom they were written. Our ministry, EPISTLE SPORTS MINISTRIES, has sought to "Encounter Professionals In Sports Through Letters of Encouragement" for over 30 years. We can have such a positive impact on others when we write letters of encouragement. How often has a struggling pilgrim been uplifted and challenged to "carry on" by a timely word written by another pilgrim! Why not drop a letter in the mail today. Encourage a fellow believer. It may not be a "famous letter" in the eyes of the world but in God's economy and in the eyes of the recipient it might be historically life-changing. Glad to hear you're back safe and sound. I checked back...and really love this post! Great post, Pilgrim! I always wonder about letters of encouragement I've written over the years...I have a friend who moved to England, and I used to write her a letter encouraging her in the Lord every year, except the past two--I just haven't gotten around to it :( I never hear back from her, so that is a bit discouraging, too, but I really should write her. I hope others who read your blog will be encouraged to write, too! One of the things about letter-writing is that it does take time - that actual time to sit down and write, the time to collect your thoughts and consider what you're writing (as you can't just hit keys and erase and cut and paste at will), and the time to post it. It seems like in this world of speed and convenience letter writing has become a bit of a lost art. However, I always appreciate getting pieces of mail (much more so than anything electronic), and I know that when I take the time to write letters (something I'm been putting off a bit lately - thanks for making me accountable :)) that the recipients truly appreciate ths effort.